SARATOGA SPRINGS — Those who appreciate history got a real kick out of the fast start that Sagamore Farm had at this year’s Saratoga Race Course meet. With two winners in the first three days, the historic Maryland farm made a splash. It’s all part of the hopes and plans of the farm’s owner, Kevin Plank, the CEO and founder of Under Armour who bought the 530-acre farm in 2007. Made famous by Alfred G. Vanderbilt Jr., who owned the training/breeding farm from 1933 until 1986, Sagamore was known for its Hall of Fame horses Discovery, Bed o’ Roses and Native Dancer. Sagamore’s private trainer is 32-year-old Horacio DePaz, who has been the head trainer since March 2015, but has been at Sagamore since 2011, assisting Ignacio Correas IV. Prior to that, he worked for four and a half years with Todd Pletcher. About two and a half years ago, Hunter Rankin became president of the farm. He said the first call he made was to Stanley Hough, who had retired recently but then decided to join Sagamore as a consultant. “He made his living training and picking out horses, and he’s great at both of them,” Rankin said. Hough wasn’t looking for consulting work, but had trained for Rankin’s family — notably 2011 Honorable Miss winner Tar Heel Mom — so it was an easy “yes” for him. Rankin said Sagamore has about 40 horses in training and about 100 total, including the breeding operation. It has 10 stalls at Saratoga this summer, while the rest of their racehorses are split between their farm in Reistertown, Maryland and Laurel Park. Sagamore has won at Saratoga with Southampton Way, a 2-year-old filly, and Ginger N Rye, a 5-year-old mare. Its 2-year-old filly Scary Not Scared went off in Sunday’s fifth race at 3-1, but struggled in the final furlong of the 6-furlong race and finished last of eight. That made Sagamore’s record at the meet two wins from six starts. 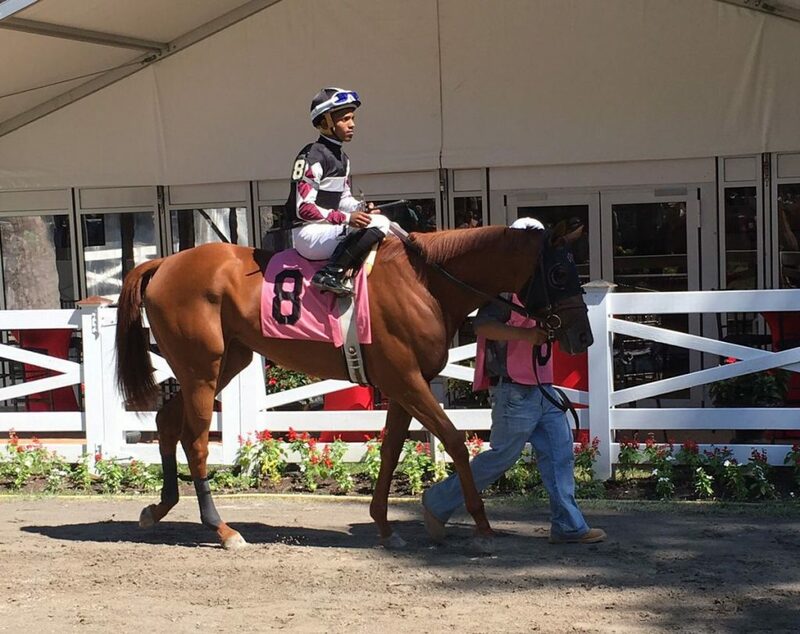 Sagamore Farm’s Scary Not Scared, with jockey Ricardo Santana, leaves the paddock for the fifth race Sunday at Saratoga Race Course. “We’ve got to finish the way we started,” Hough said. “Today wasn’t a great day, but we’ll live to fight another day,” Rankin said. Rankin and Hough are high on DePaz. “He’s a young guy with a lot of ambition, a good learner,” Hough said. Rankin said Plank always wants what’s best for the horse, whether one is ready to race early in life or later. They may shuffle in a few more 2-year-olds to run at the Spa, possibly including horses in the Saratoga Special and Adirondack Stakes. Paid Up Subscriber, a 5-year-old mare, absolutely romped in the Grade III, $200,000 Shuvee, winning by 32 ½ lengths. The victory was the largest margin of victory at Saratoga since Summer Colony’s maiden win of 32 ¾ lengths in 2001. The New York State Gaming Commission levied two fines for incidents at Saratoga. Jockey Kendrick Carmouche was fined $2,000 for careless riding aboard Rocky Policy in the eighth race Thursday. The Commission ruled Carmouche failed to maintain a straight course and didn’t have proper clearance when his mount drifted out inside the one-eighth pole. Trainer Mike Maker was fined $500 for failure to tend to business in a proper manner which necessitated a scratch from the fifth race Friday. His barn used a Magna Wave machine on Perfectexpectation within 24 hours of the first race, violating a rule.